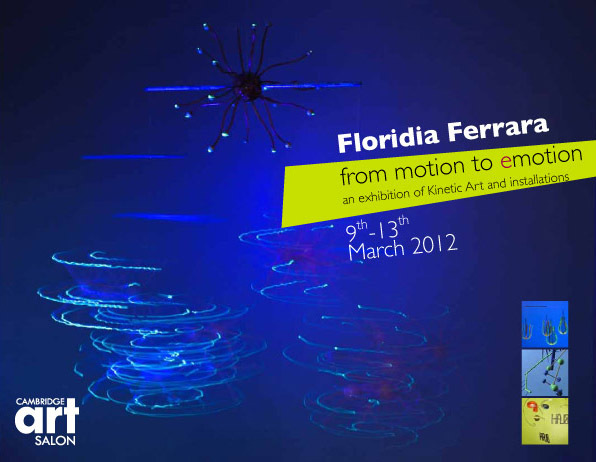 An exhibition of Kinetic Art and Installations by Floridia Ferrara. Floridia has been creating mobiles for more than 10 years. Movement and balance are two pivotal concepts in her work and her life. The artist has always been fascinated by the movement of balanced, hanging structures. As a child she enjoyed experimenting with coloured cardboard and assembling geometric patterns which she would hang up and then spend a long time watching them move, animated by the draft coming in from her window. Many years later, she built her first mobile in balsa wood. The intersection of lines and shapes moving together and then separating again also makes space for the viewer’s own interaction with the artwork and this vital connection and interaction between art and viewer creates chances an for an active two-way fruition. Her handmade structures in balance are unique works of art and cannot be reproduced .She loves researching and experimenting with different materials (wood, copper, papier-mâché, resins, perspex, recycled objects etc.) from which she draws inspiration for her creations. At the Cambridge Art Salon she will also present one of the installations of her “Beside” project dealing with the concept of identity, its interpretation and representation. At the opening, Minimal Sound System, a Cambridge-based sound artist who originally composed the soundscapes of one of Floridia’s installation, will delight the audience with an exquisite live dj set.